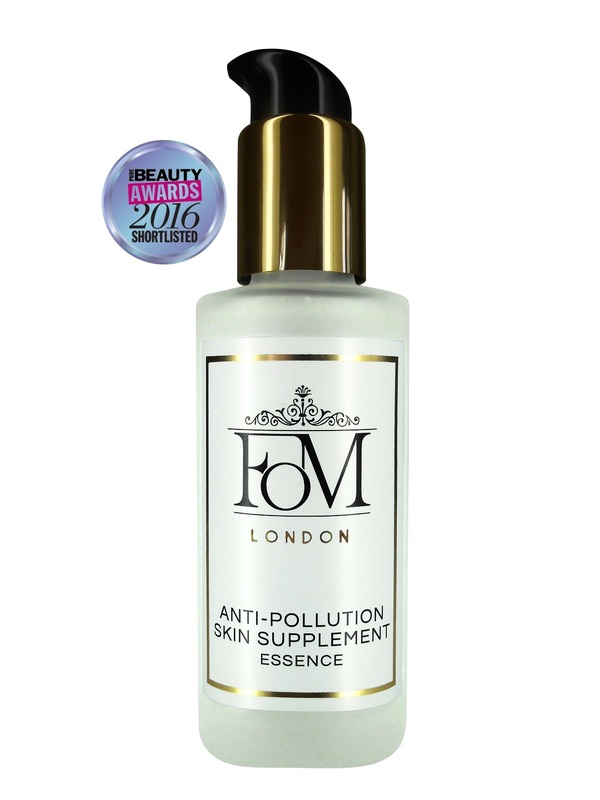 Home / SkinCare / FOM London Skincare Anti-Pollution Skin Supplement Essence. 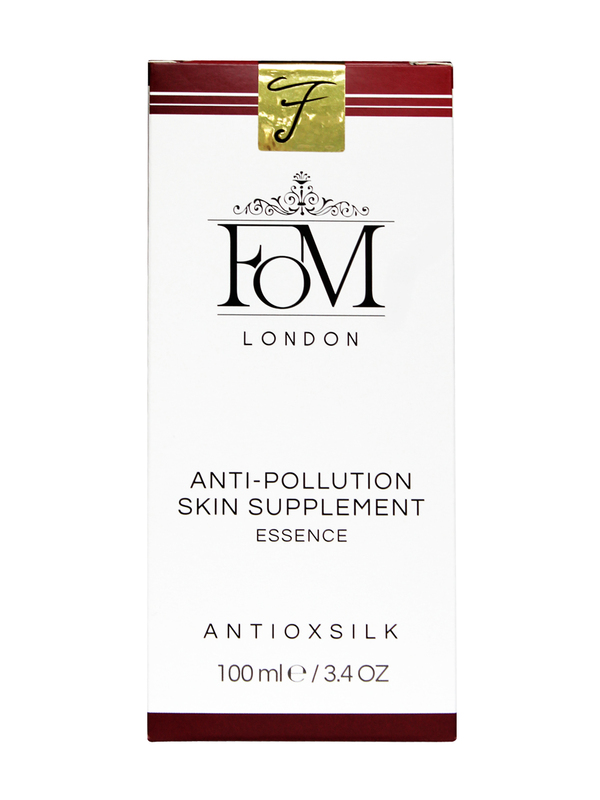 FOM London Skincare Anti-Pollution Skin Supplement Essence. FOM London Skincare innovate sustainable luxury skincare for everyone. The first skincare brand that takes care of anti-pollution by offering you super powerful skincare products that help to improve skin resilience to pollution with hydra plus brightening benefits. The brand create innovative, cutting edge, luxury and scientifically evidenced skincare products with multifunctional benefits to address aging caused by pollution and environmental stressors along with underlying causes. A facial essence contains higher levels of active ingredients with intentions to penetrate deeper into your skin. Adding an essence into your skincare regime will instantly balance your skin after cleansing, adding hydration whilst priming your skin, ready for you to use your other products. FOM London Skincare concept is very simple: Bringing your skin to a healthy state, help improve skin resilience to environmental stressors including pollution. The first skincare brand to take care of protecting your skin from pollution that is outdoor as well as indoor. 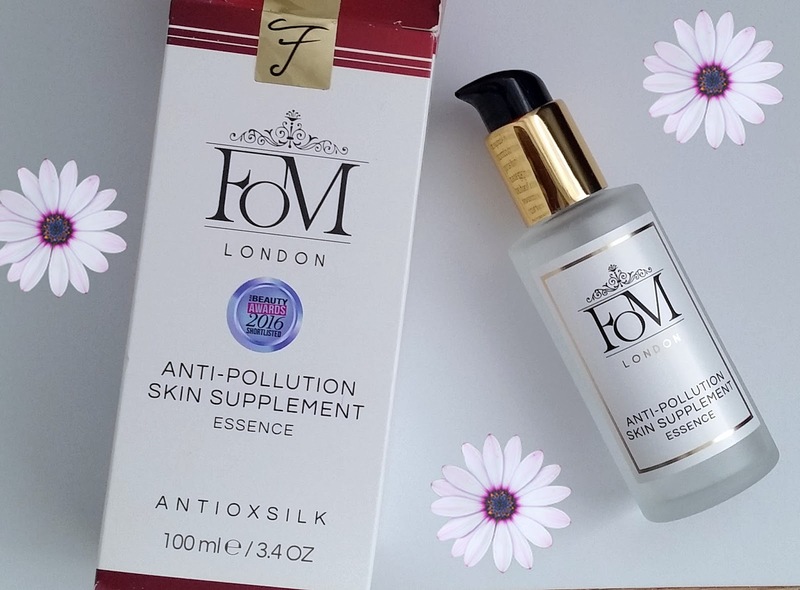 FOM London formulations and manufacturing processes use innovative anti pollution age defying technology that utilises complex of pure silk, antioxidants and adaptogens, which is named AntioXSilk ANTI-POLLUTION Technology. This technology is exclusive to FOM London and proven to bring you the most effective skincare products to improve skin resilience to pollution with hydra repair and brightening benefits. FOM London own their formulae and do not share them with other companies, they also do not use generic fillers or pre-made cosmetic basis in any of their products. Every ingredient used has a specific purpose and delivers targeted results, so you can see and feel the benefits when used. Following a strict policy in place NOT TO USE toxic ingredients and chemicals that are not beneficial to your skin and your general wellbeing. FOM London products are free from parabens, colours, silicones, synthetic fragrances, mineral oils, sulphates, as well as being proud to say that they are against animal testing and their products are never tested on animals. Suitable for all skin types, this first of its kind skin supplement treatment in a base of silk and floral bouquet bathes skin in moisture whilst anti-pollution Juniper and Sage detoxify and protect the skin from free radicals. Your skin is ready to welcome all subsequent serums and/or creams. The tannins and flavonoids in red raspberry leaves stimulate skin regeneration process whilst skin toning and tightening Guava leaves help reduce redness and dark spots. This product contains no added scent and divine floral fragrance of the product is natural and extracted from plants. Anti-Pollution Skin Supplement Essence Benefits. Apply 2 pumps onto a cotton pad and gently smooth the essence onto your face and neck. Apply mornings and evenings after cleansing as the first step towards your anti-ageing skin moisturising regimen. Follow with a serum and/or cream. ROSA DAMASCENA (ROSE) WATER. CITRUS AURANTIUM DULCIS (ORANGE) FLOWER WATER. GLYCERINE. JUNIPER COMMUNIS (JUNIPER) WATER. SALVIA SCLAREA (CLARY SAGE) WATER. ROSMARINUS OFFICINALIS (ROSEMARY) WATER. HAMAMELIS VIRGINIANA (WITCH HAZEL) DISTILLATE. HYDROLYZED SILK PROTEIN. PANTHENOL. SODIUM HYALURONATE. PSIDIUM GUAJAVA (GUAVA) LEAF EXTRACT. SODIUM BENZOATE. RUBUS IDAEUS (RASPBERRY) LEAF EXTRACT. PHENOXYTHANOL AND CAPRYLYL GLYCOL. The Anti-Pollution Skin Supplement Essence has a Texture that is water like and very refreshing to the skin. Using the pump applicator on the bottle to dispense onto a cotton pad, u can detect the light floral fragrance which is beautiful. You only need a little of the product to sweep over your skin and feel the immediate effects of a refreshed complexion and soft smooth silky skin. I have never used so little of a product to see immediate and visible results that last through out the day protecting your skin. 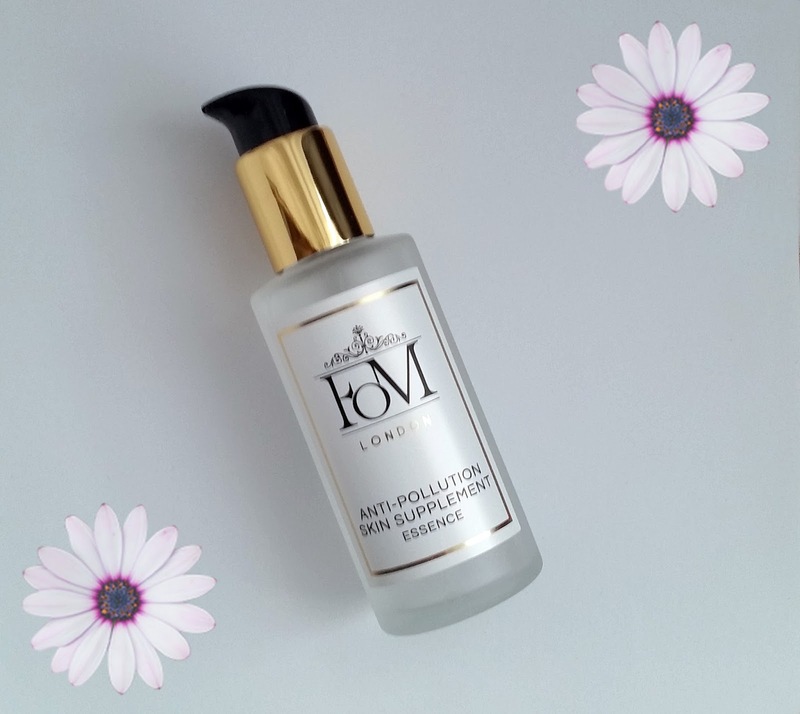 The FOM London Anti-Pollution Skin Supplement Essence is easy to incorporate into your skincare regime and will not only improve, but protect your skin all year round. This is the one product that is a must have in your skincare, the ultimate anti pollution skin weapon. Protect your skin and find out more at ManOrganic. X Neil.